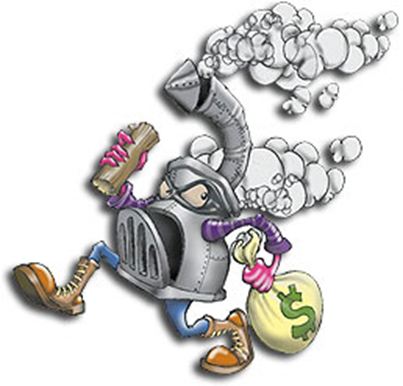 The Wood Stove Exchange Program began in 2008 with the intent to provide incentive for replacing old wood stoves (very high particulate emissions) with efficient, low emissions models or alternatives through $250 (per appliance) rebates. This program is funded by the BC Ministry of Environment and overseen by the BC Lung Association. The ACRD has participated for the past decade, providing about 365 rebates to residents of the Alberni-Clayoquot Regional District. 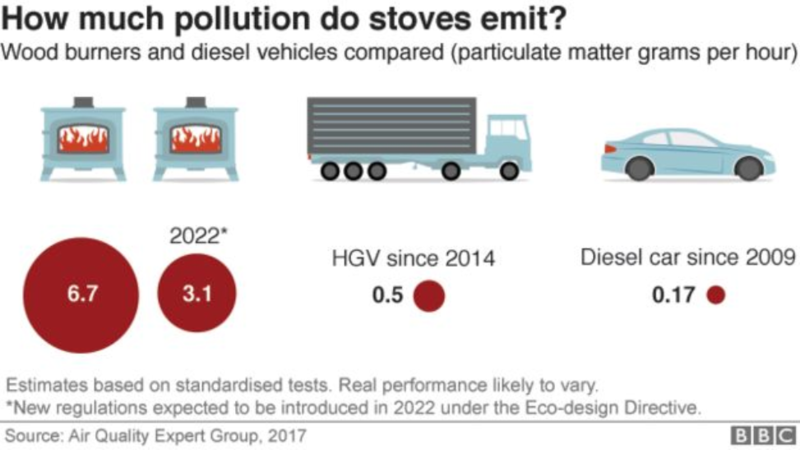 Pollution from woodstove heating can impact your health, as well as the health and well-being of your neighbours, your family and your kids. While woodstoves may provide a cozy living room atmosphere, old uncertified woodstoves contribute to poor air quality. Particular matter (PM2.5) released from activities including wood burning, has been found to negatively impact the body, especially the lungs and heart. This program runs on a first come, first serve basis. There are limited quantities of each of the two available rebates. Vouchers have a 90-day expiry from the date of issue. The program is introducing an option for households with any wood stove manufactured prior to 2014 to participate in the program if they are switching to a new pellet or gas heating appliance or electric air-source heat pump. The rebate amount for this option is $500. The uncertified woodstove to certified woodstove exchange has remained at $250. The reasoning for the higher rebate for the alternate home heating options are to encourage people to move away for wood heat as the primary heating option. 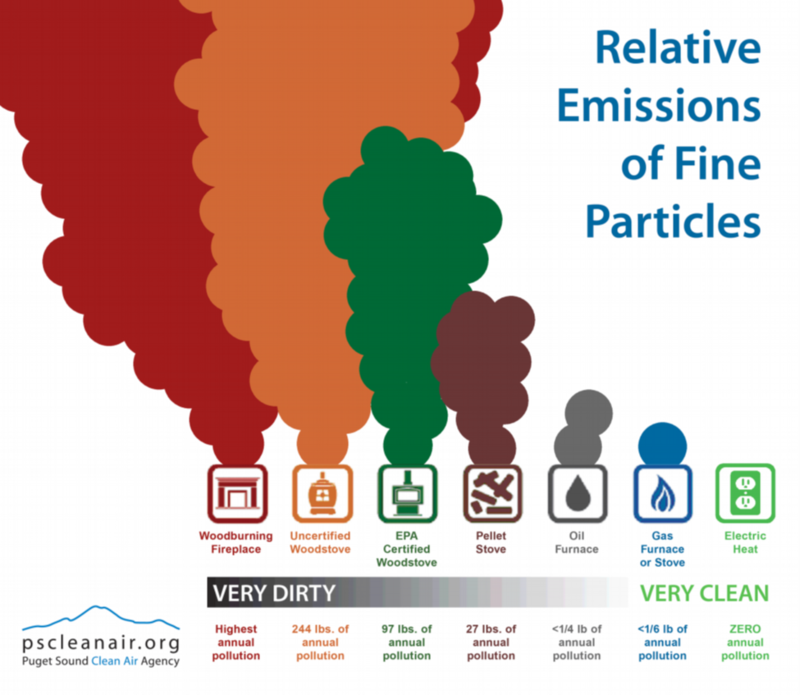 The chart below shows the relative emissions of fine particulates based on your home heating option. home on the property has a wood burning appliance that is regularly used as the home's heat source. For exchange to a new gas or pellet stove or an electric heat pump, the existing wood burning appliance must have been manufactured prior to 2014. For exchange to a new wood burning appliance, the existing wood burning appliance must be non-EPA certified (manufactured prior to approximately 1994). old wood stove is removed, decommissioned and recycled (ie. it cannot be re-used in a workshop or garage and the landfill must sign off on your voucher). work must be done in compliance with local code requirements. Dolans Gas Fitting and Heating Ltd. The expectation is that for the $250 rebates the retailer will provide a $150 discount and for the $500 rebates the retailer will provide a $300 discount. There are limited quantities of each rebate type, and they will be distributed on a first come, first served basis. For those exchanging their wood stove for a natural gas stove or fireplace, eligible models are those eligible under FortisBC's EnerChoice program. If you heat your home with a woodstove, following safe burning practices improves your heating efficiency while reducing air pollution. To help you get the most out of your wood, only use dry wood (wood with less than 20% moisture content). Otherwise your fire won't burn as hot and you will be creating harmful smoke by drying wood in the woodstove. Check out the Provincial Wood Burning Guidelines for more information on how to properly dry, store and build your woodstove fires. A new 9 minute film called The Cost of Wood Heating was released by Breathe Clean Air Comox Valley and features Dr. Charmaine Enns, medical health officer for Vancouver Island north and a number of local residents who are affected by wood smoke. The film outlines a range of known health effects caused by wood smoke, including asthma, reduced lung function, heart disease, lower birth weights, stroke and shorter life spans. Acceptable air quality is everyone's right. Protecting air quality is everyone's responsibility.